Helsinki is the capital city of Finland, situated on a peninsula in the Gulf of Finland. The tramway (‘raitiotie’ in Finnish) began in 1891 and covers the city centre and the inner suburbs to the north of it. Starting with horse-drawn trams, the system was electrified in 1900 and by 1930 it had reached its maximum expansion and was privately operated. In 1945 a new municipal transport operator was formed, HKL (Helsingin kaupungin liikennelaitos), that still runs the trams in 2017. At the time of our filming in May 2017, the fleet was made up of some 40 high-floor trams manufactured by the Finnish company Valmet, (Nr I type) and 42 similar vehicles of the Valmet Nr II type. These trams have a low-floor section added. In the late 1990s, 40 low-floor Variotram vehicles arrived made by Adtranz, later to become Bombardier. 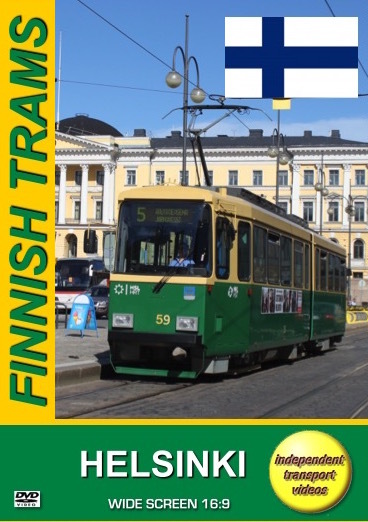 The newer trams are Transtech Artics and are made by the Finnish company Transtech, the successor of the Valmet company. Further newer trams are manufactured by Skoda but to the same design as the Transtech cars. This film is made in the course of a day, starting in the morning and ending late at night in this land of the midnight sun! Our morning filming begins onboard tram 99 a Valmet NrII tram that takes us to Ooppera on the long Mannerheimintie thoroughfare. A good deal of filming is done on Mannerheimintie as this road makes its way through the city with plenty of good vantage points to see the trams (and buses) in action. We see the latest fully electric bus built by Linkker on route 23 at the railway station. There are four in service, which are operated by Helsinki City Transport (HKL), having entered traffic in January 2017. We also see the trams running past the delightful architecture of the railway station. In order to view the tramway system to its best advantage we take a number of tram rides on different types of tram on various routes. From the city centre we board tram 120 on route 10 to Pikku Huopalahti and return on tram 108 to Töölön halli in order to visit the small Tramway Museum that is situated behind the Töölön tram depot. We then take a ride on tram 99 on route 4 from Ooppera to Katajanokka. From here we return to Töölön halli to connect with tram 410 to ride to Kamppi on route 2. From here we ride on tram 229 on route 2/3 to Viiskulma for more filming in this pleasant suburb. Tram 55, a Valmet Nr I, on route 1A takes us to Olympialaituri where we see the trams in the company of large ocean-going liners at this busy sea terminal. We then film at Kauppatori, Aleksanterinkatu and Mannerheimintie. Further tram rides on routes 6T and 8 show us the suburbs of Arabianranta and Rouholati. Evening filming begins at Kanavakatu Tove and continues to the city centre to capture the action as the sun sets during the long twilight hours. We hope that you have enjoyed your journeys around Finland’s capital city as much as we did filming it for you!